Yeshivat Sha'alvim's curriculum is broad-based and aims to cultivate proficiency in the many fields of Jewish scholarship. Following the classic yeshiva model, the backbone of the yeshiva's curriculum is dedicated to Gemara study. However, students are also provided high level shiurim and learning opportunities throughout the day in a wide range of fields that augment the Sha'alvim student's knowledge base. Topics are outlined below and include tanach, halacha, machshava (Jewish philosophy), and mussar (ethics). 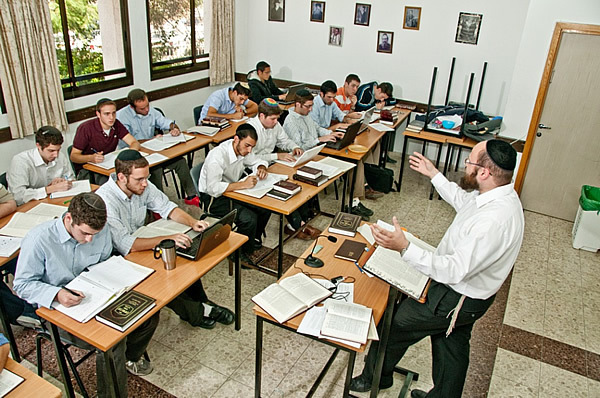 In addition, the yeshiva provides a number of informal learning opportunities that contribute to the personality and character of the students, and complement the learning engaged in throughout the day. In-depth Gemara study (Gemara be-iyun) is the hallmark of a talmid chacham and is the focus of study all morning, and reviewed each evening. The iyun shiurim in Sha'alvim emphasize conceptual methodology, without sacrificing students' mastery of the subject matter and increasing their textual skills. Each Rebbe has his own unique style that challenge their students to grow to their fullest potential in gemara learning. Afternoon seder is primarily dedicated to a quicker paced study of gemara. Over the year, Sha'alvim has developed an extensive be-kiyut program that successful trains students to master large portions of the tracate being studied. Led by Rav Eli Pielet, accomplished author of the Sefer She'elat Chacham, the be-kiyut program provides a study pace, source sheets for more advanced study (click here for an example), review questions (click here for an example), shiurim, and optional exams. Every morning, before iyun seder, the entire yeshiva studies practical halacha. Review questions are distributed (click here for an example), and a halacha shiur is delivered on a regular basis. Over the year, a significant area of halacha is mastered by the students. Every afternoon, optional shiruim in a number of areas are taught at the end of afternoon seder by well known speakers. Descriptions of these shiurim can be found on the Shiurim & Classes section of the website, and audio of many of these shiurim can be listened to or downloaded in our Torah section. In addition to the above shiurim and learning groups, a number of informal learning experiences are provided after night seder throughout the week. These experiences generally take place in the private homes of our staff.